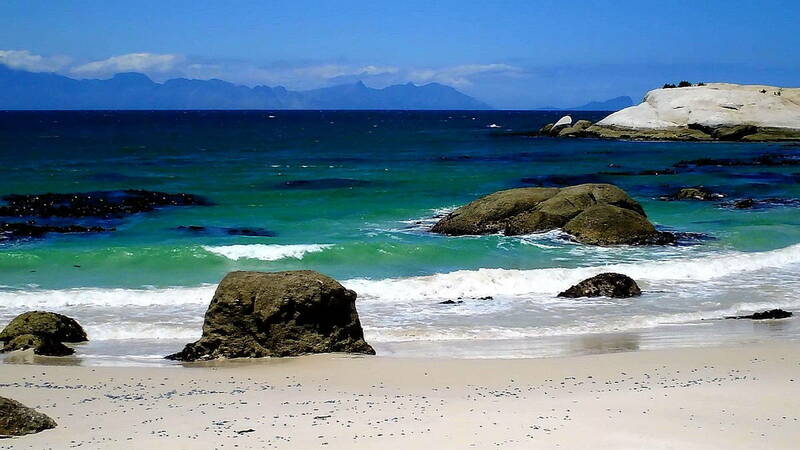 On our circuitous route around South Africa, Bob and I found ourselves, at one point, on the coast following the Garden Route south to Cape Town and onward to the Cape of Good Hope. 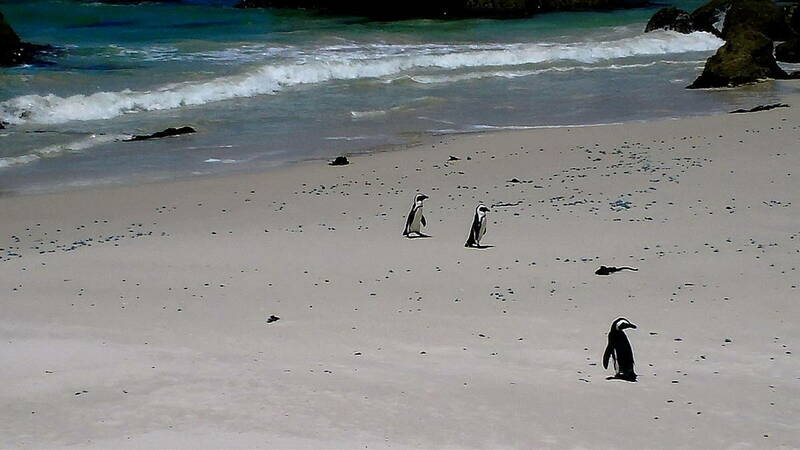 One of the stops we made while in that area was at Boulders Beach where a colony of African Penguins is found. 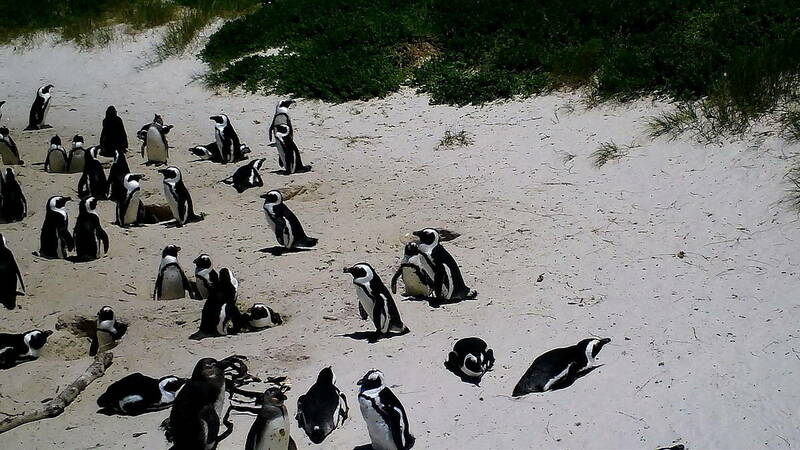 It was great fun watching them waddle to and fro across the sand. We began the day by heading south from Sea Point, an area of Cape Town where we were staying, toward Cape Peninsula. It was hair-raising driving along sheer rock faces, but views of the crystalline blue waters of the ocean and broad, long beaches of snow-white sand helped take my mind off the precipitous cliffs that drop away at the edge of the roadway. 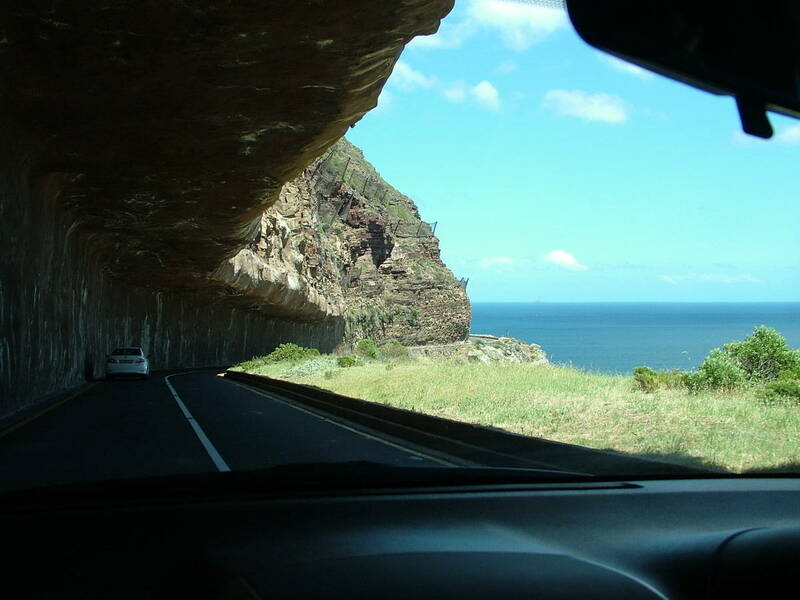 I felt so much more secure when sliding along on a road surface carved into the mountainside. It was quite novel, in fact. 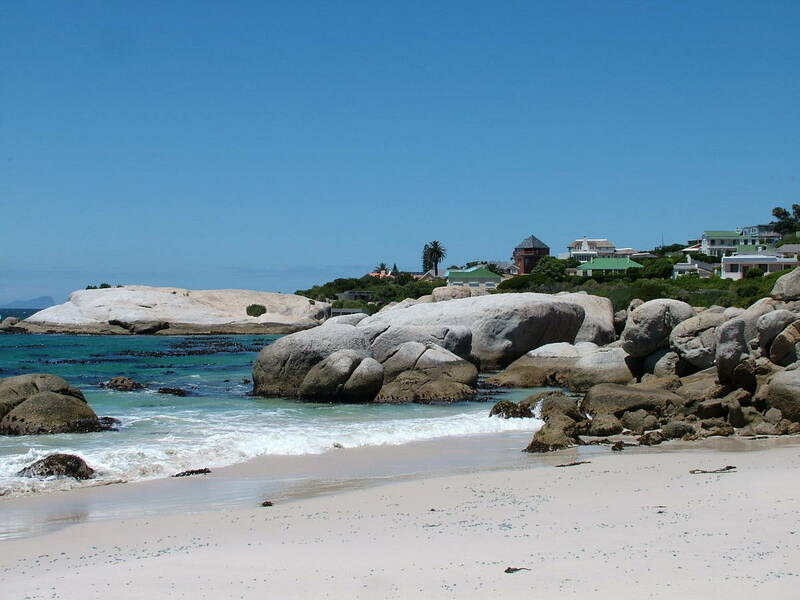 Boulders Beach is little more than a sheltered cove on the Indian Ocean side of Cape Peninsula, yet it encompasses a number of sheltered inlets along that one stretch of the coast facing Fanny Bay. 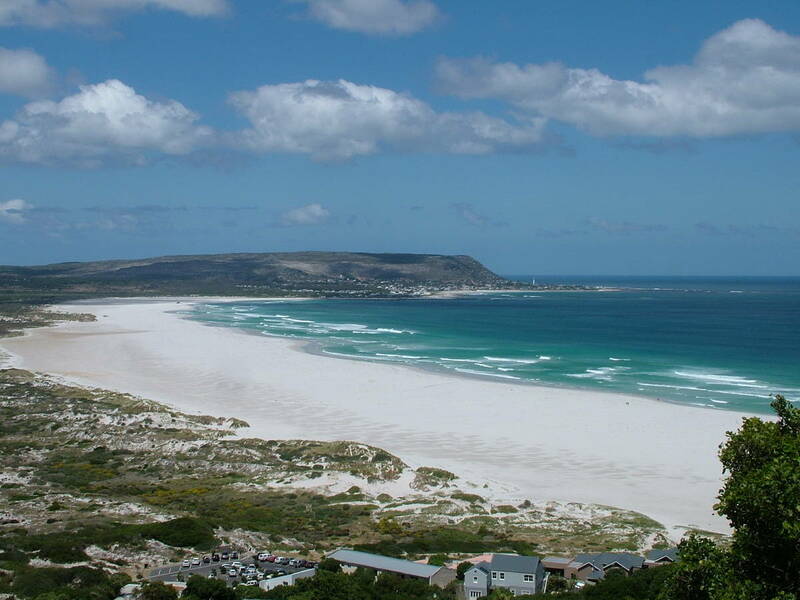 It is part of Table Mountain National Park. 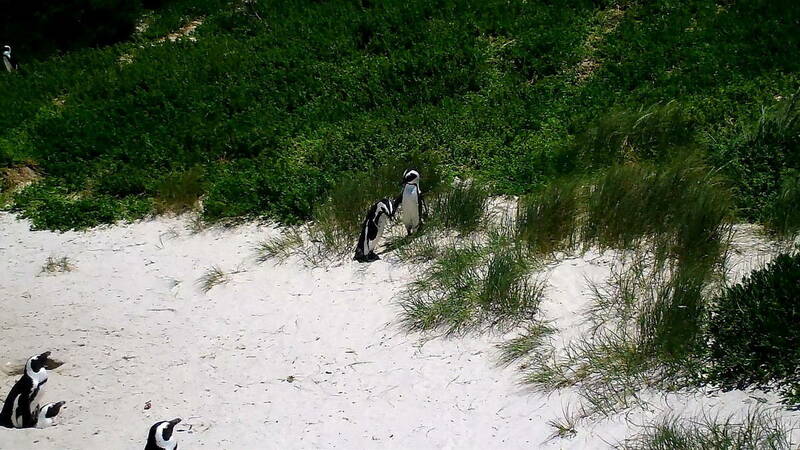 It was quite surprising to find that Boulders Beach is located within a residential area, but in 1983, a pair of African Penguins found their way from Dyer Island to this cove, and they decided to stay. Commercial fishing was, at that time, banned in Fanny Bay which meant a bountiful source of food nearby, and in combination with the ideal nesting site, the Penguins found the beach quite suitable. 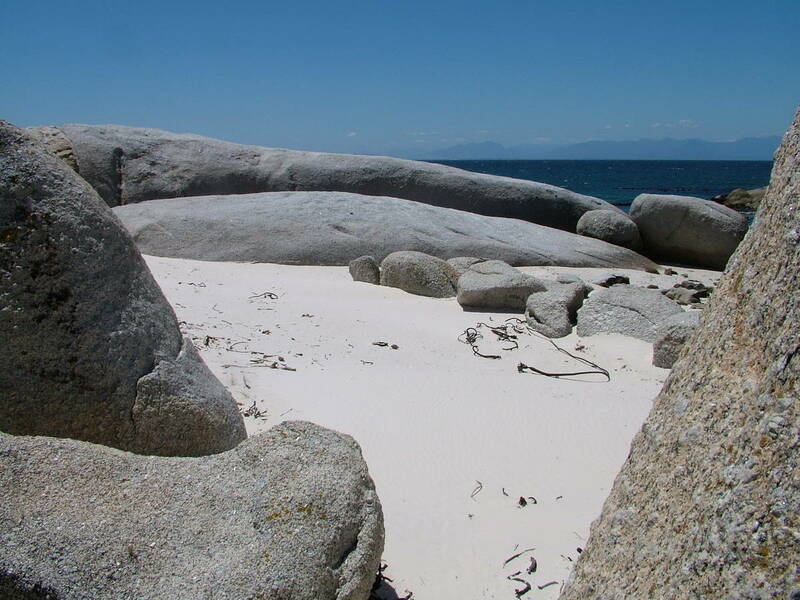 massive granite boulders protect the shoreline from wind, strong currents and severe wave action, and the soft white sand is perfect for building nest holes. 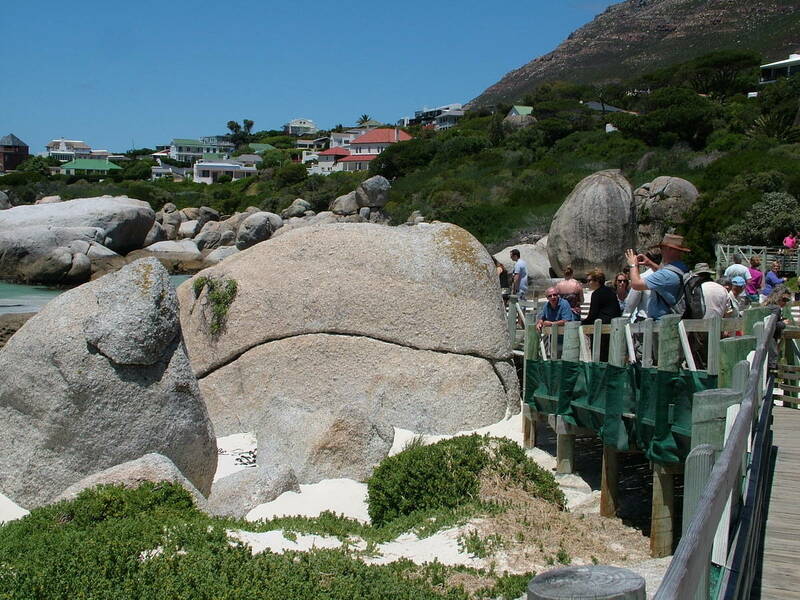 Because conditions at Boulders Beach also appeal to people who want to do a little sunbathing and swimming, because the water is warmer than the icy temperatures along Cape Town’s beaches on the Atlantic Ocean, access to the nesting habitat of the African Penguins is prohibited to protect the birds, their nests and chicks. 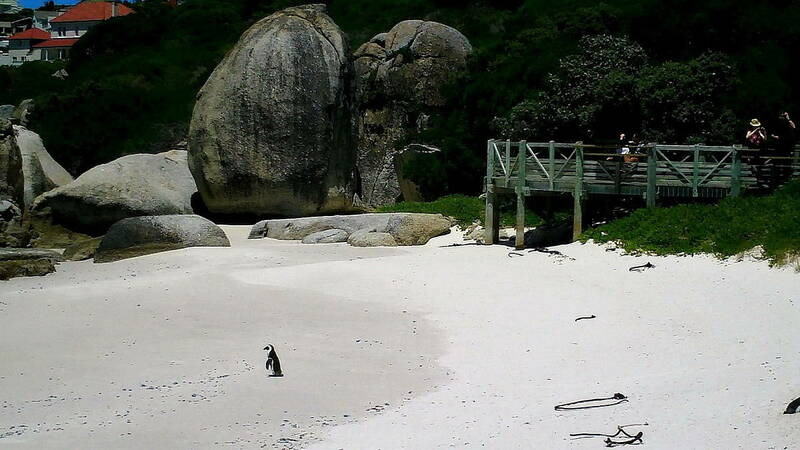 A raised boardwalk conducts eager visitors to a viewing location overlooking the African Penguin colony. 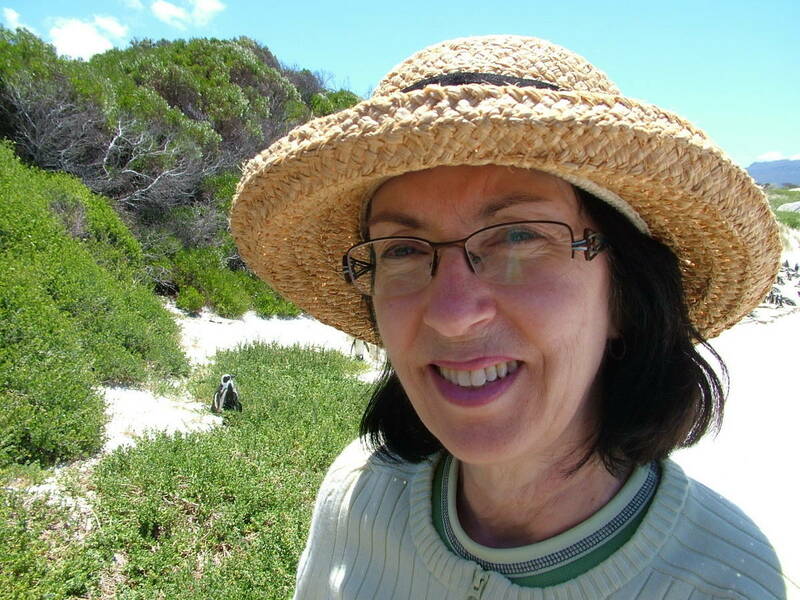 Bob and I enjoyed a pleasant walk on the wooden promenade that threads through dense vegetation, over dunes, and skirts the two other pristine beaches within the Boulders Beach section of Table Mountain National Park. 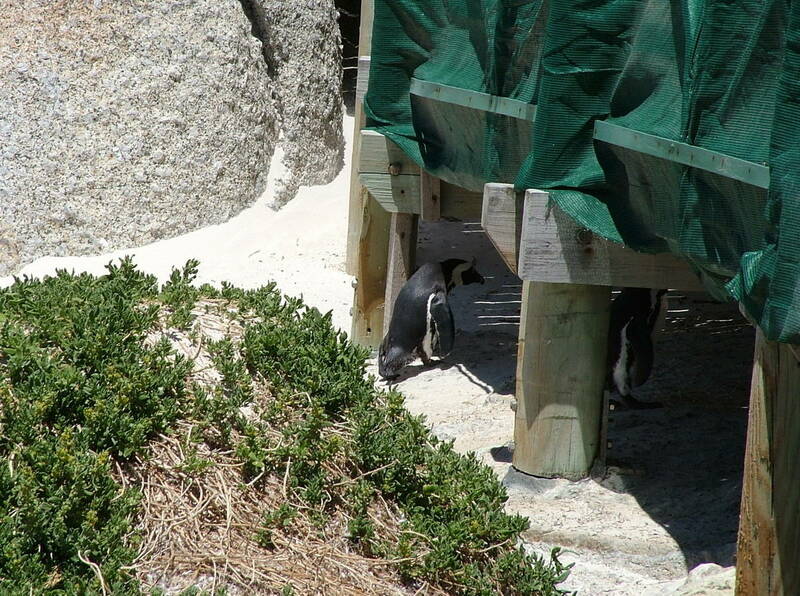 Where the elevated walkway ends is within close range of the African Penguins. What a sight for sore eyes! 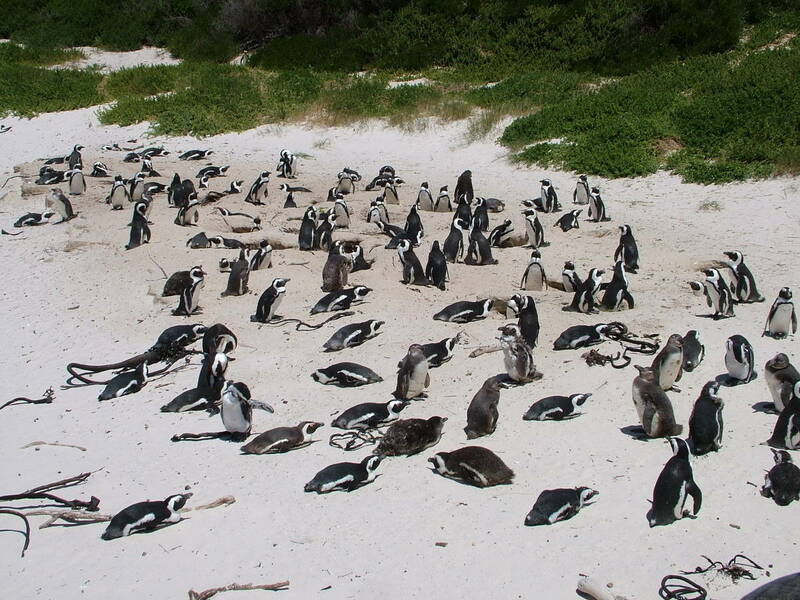 The colony that began with just one pair of Penguins numbered some 2,100 penguins when we visited. I hardly knew where to look first. 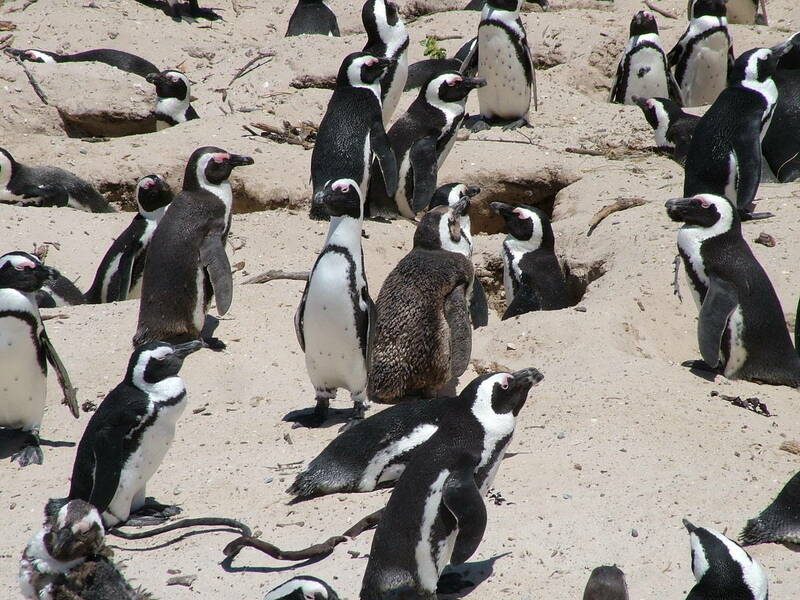 The African Penguins were each engaged in some form of activity be it preening or basking in the sun, returning to the beach with their beak full of twigs and grasses, excavating a nest hole or simply socializing. African Penguins are medium-sized penguins that stand about 2 feet tall while weighing between 5-8 pounds. One distinctive feature of these Penguins is their black facial mask topped with a pink patch of skin above each eye. 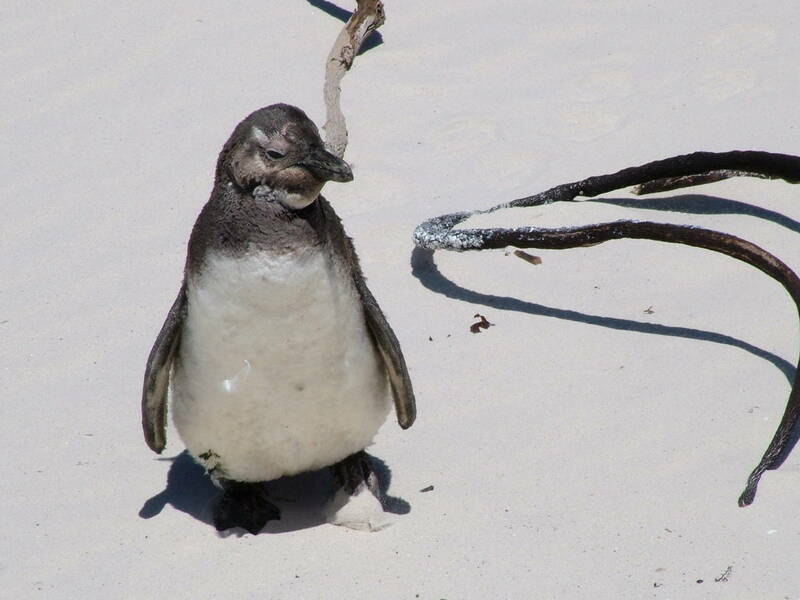 This pink patch is a gland that deepens in colour if a Penguin gets hot because it becomes suffused with blood that is then cooled by the surrounding air. The rotund bodies of African Penguins are stylishly patterned in black and white so the birds resemble tuxedo-clad gentlemen. To see them teetering across the beach made me giggle. In fact, as I watched this pair halt at the edge of the sand, I do declare that the two of them were like an old married couple contemplating what they should do for the afternoon. It is possible to distinguish one African Penguin from another by the placement, size and shape of black spots on each penguin’s chest. Equivalent to our fingerprints, each Penguin’s spotted pattern is unique and specific to that individual. Other diagnostic features of an African Penguin are its black feet and the upside-down horseshoe shape of the black band on its chest. 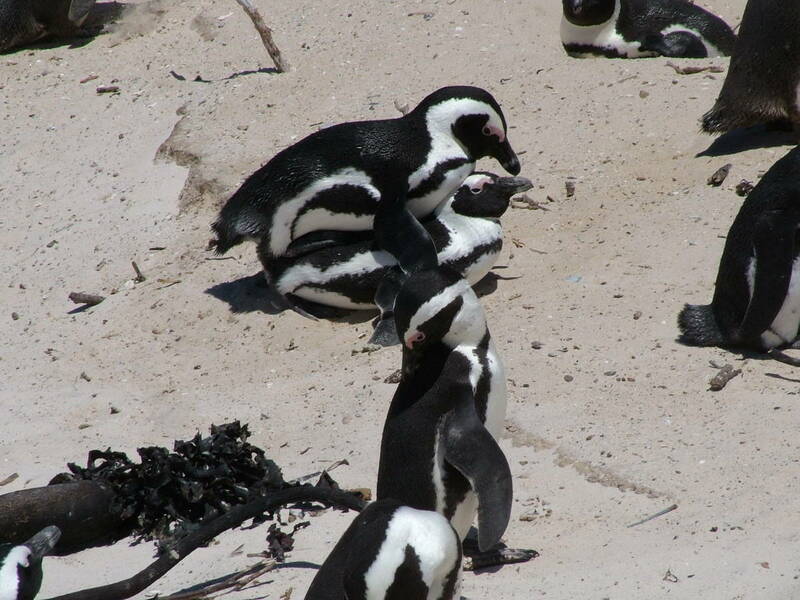 Juvenile African Penguins do not have the sharply-defined black and white patterns yet, and their dorsal surface is paler, ranging in colour from greyish-blue to brown. 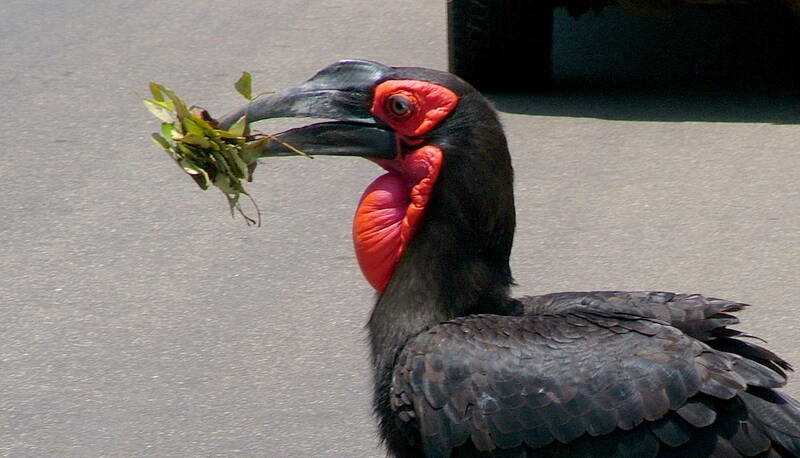 Juveniles also lack a black band across the chest and the black spots that make them identifiable. African Penguins are the only species of penguin to nest on the African continent, and Africa is the only place where this species of penguin is found. The colony in South Africa is one of only a few on the continent, and the only colony where people can get up close to these aquatic flightless Penguins. 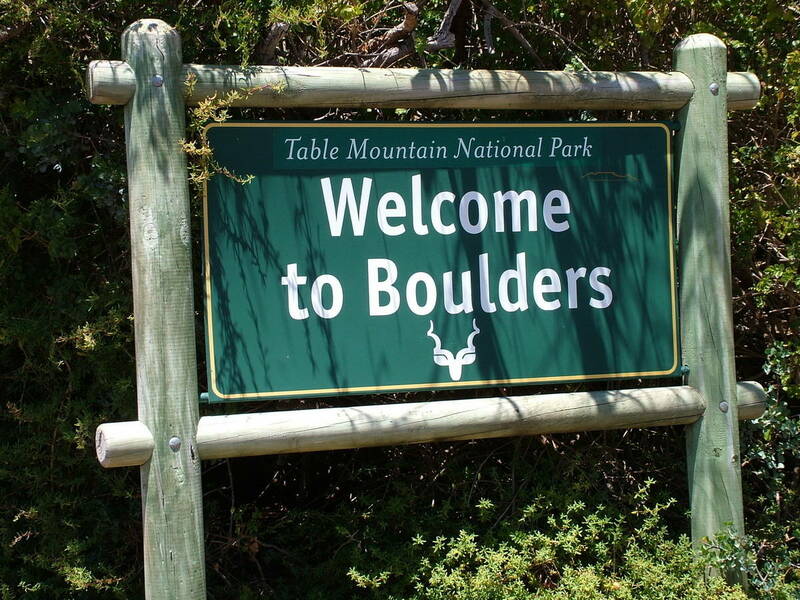 That is why we made a point to visit Boulders Beach. Checkout our video from our visit. 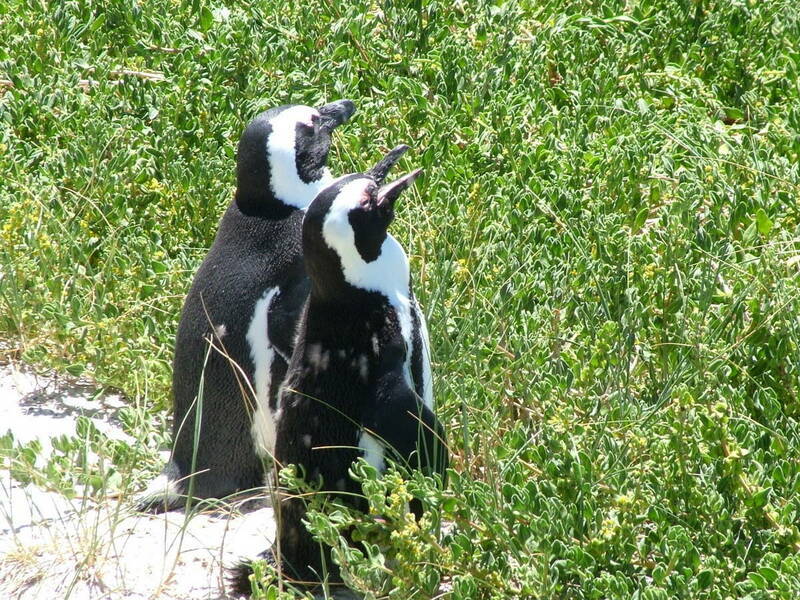 A mated pair of African Penguins stays together for life, and they return to the same nesting location every year. Unlike many other bird species, African Penguins have an extended breeding season which means that, at any time of the year, Penguins within a colony can be at different stages of the courting, breeding, incubating and brooding cycle. 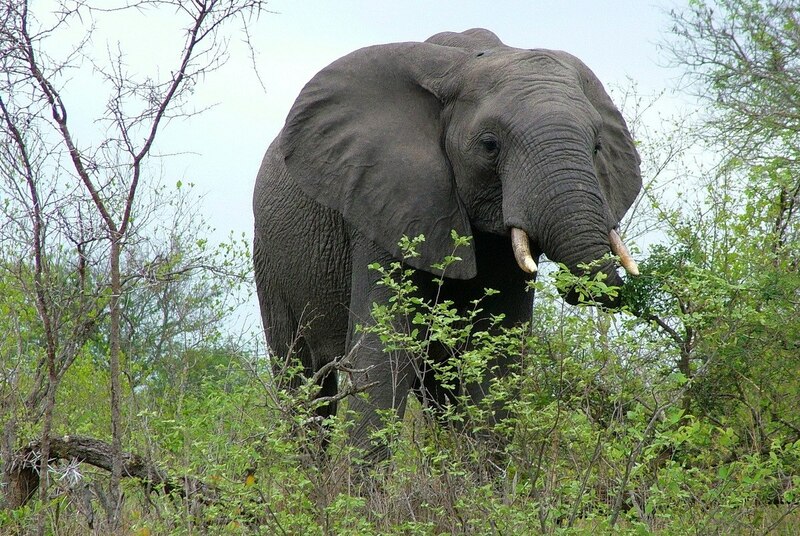 Peak breeding period is between March to May in South Africa. 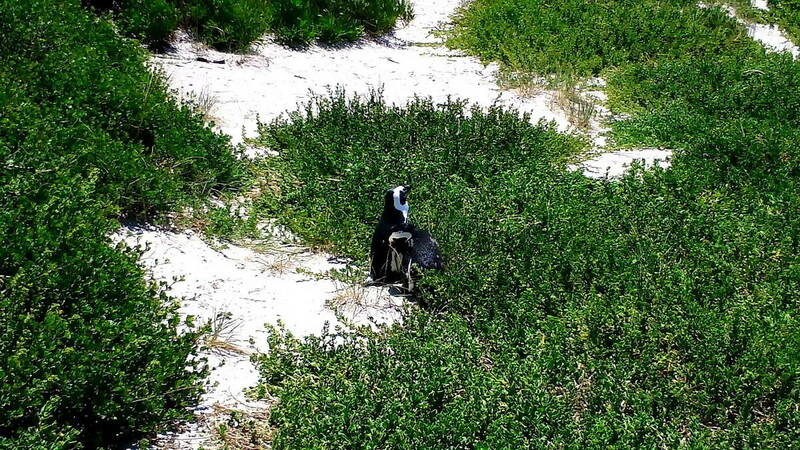 We visited Boulders Beach on November 17 and at the time observed African Penguins actively engaged in copulation, digging nest holes or lining the nest cavities with bits of vegetation, and saw juvenile Penguins wandering the beach with all the adults. 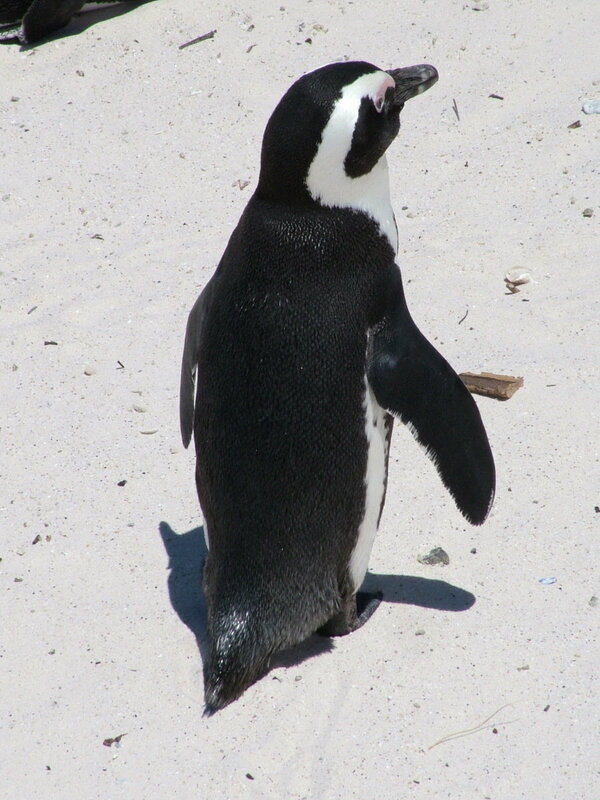 African Penguins are birds capable of withstanding cold sea water. Their bodies are well insulated by stiff, overlapping layers of feathers that keep out water and wind while at the same time trapping a layer of warm air next to the body. 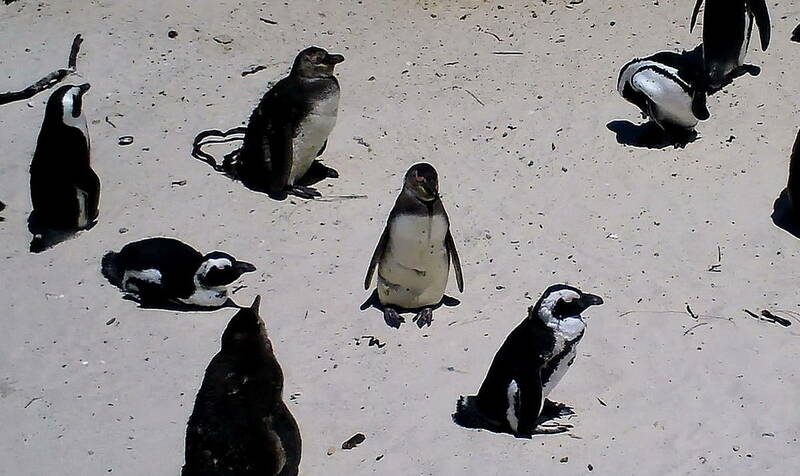 These same attributes mean that African Penguins find it a challenge to keep cool in the hot African sunshine. To this end, African Penguins are usually most active at dawn and dusk, and situate their nests in a burrow or underneath a tree trunk, boulder or bushes so they can keep out of the sun when incubating eggs or brooding chicks. 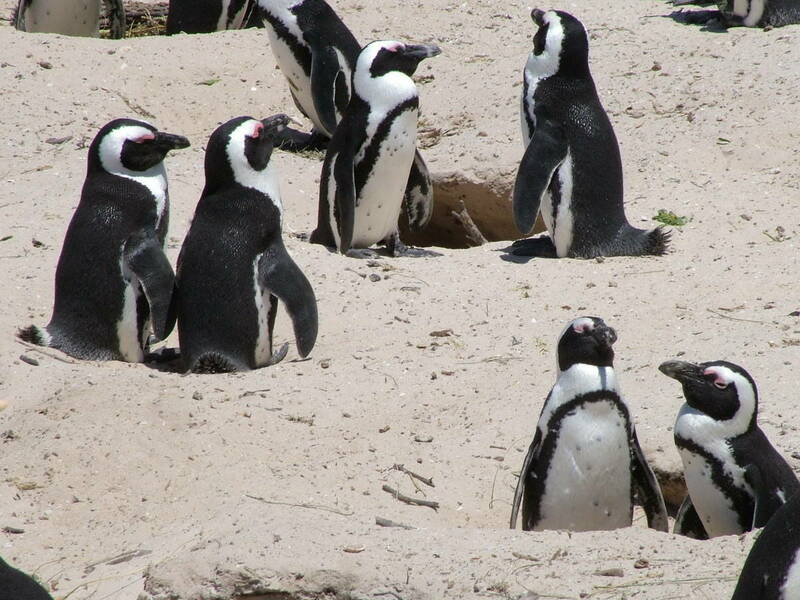 There, at Boulders Beach, even the shade beneath the raised boardwalk provides adequate cover for the African Penguins, but also, in recent years, authorities have begun to provide nest boxes so eggs and chicks have a better chance of eluding predators. and go for frequent swims to cool off or to forage for food. 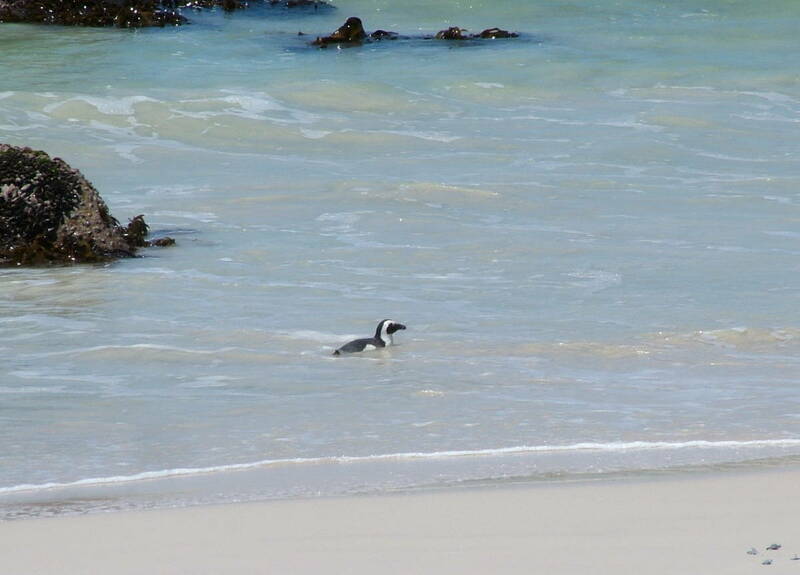 Younger African Penguins and adults with young chicks will fish closer to shore than other mature Penguins, keeping to a distance of about 20 kilometres. Shoals of fish such as herring, anchovies, sardines and mackerel make up the bulk of their diet. 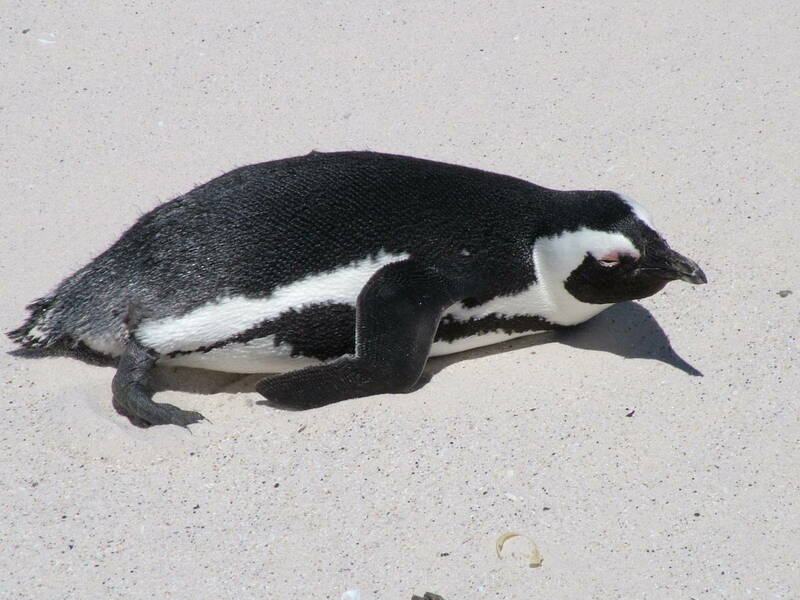 It is no surprise that the streamlined shape of an African Penguin’s body aids its movement through the water. When foraging, they can shoot through the water like a torpedo at speeds of up to 20 kph. One interesting detail about African Penguins is the fact that they once were called Jackass Penguins because their calls sound remarkably like a donkey braying. It is the funniest thing I’ve ever heard and had me doubled over with laughter. 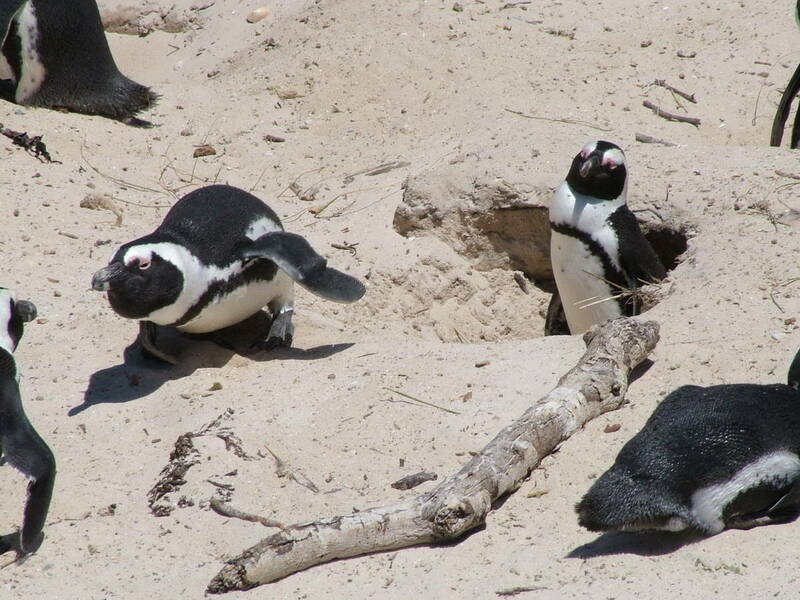 As Bob and I watched pairs of African Penguins scoping out locations for their nest, we had to wonder how some of these couples could manage with their beaks and flippers to dig burrows above the high-water mark where vegetation was growing quite profusely. 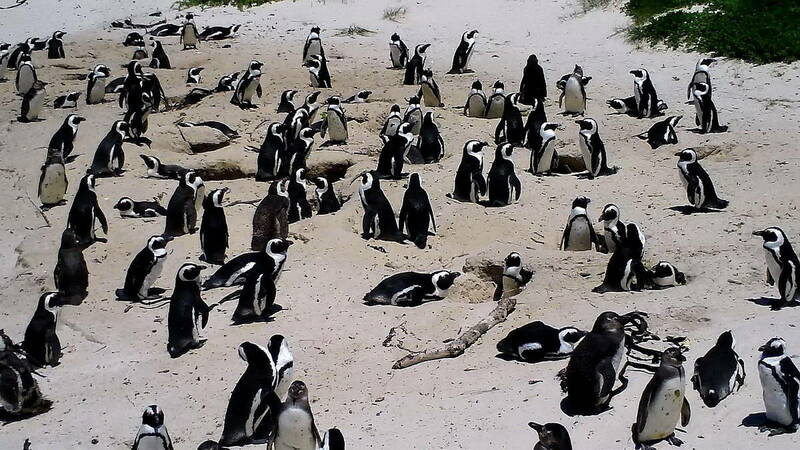 It was very interesting observing and learning about this endemic species of Penguin. I only hope that their numbers do not continue to dwindle because of threats from climate change, over-fishing, oil spills and loss of habitat. They are a very special bird!